People often need signs and symbols to express what cannot be said in words. The Church uses signs and symbols to help convey the mystery of God and to help us grow in faith. St. Augustine described the Sacraments as outward, visible signs of inward, invisible grace. The first step of a lifelong journey of discipleship. of the Rite of Christian Initiation of Adults (R.C.I.A. programme). 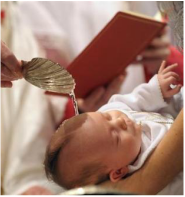 Adults desiring baptism are invited to call the Parish Office. on the 2nd and 4th Sunday of each month. and the spaces fill up quickly. Please provide the parish with ample notice. once per month only, on the first Sunday of each month. is required and is available to parents bi-monthly. Married couples lead the sessions in the Parish Hall. if child care is an issue, parents may bring their children. Godparents may attend but their presence is not mandatory. The couples from the team also assist on the day of baptism. allowing families to focus on the beauty of the sacrament. and to help them grow in mature spirituality. Adults are confirmed on Holy Saturday within the framework of the R.C.I.A. Those desiring to be confirmed are invited to call the Parish Office. with their Religion class focusing on preparation. is the heart of Catholic belief and worship. and seek to live in charity and love. on Holy Saturday at the Easter Vigil. preparing throughout the school year to receive this sacrament. The Eucharist is the centre and origin of the life of the Church. 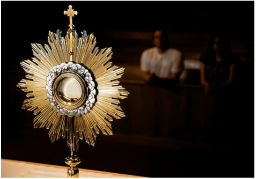 Therefore, every First Friday at St. Clement’s, the Blessed Sacrament is exposed from 8:30 a.m. to 5:00 p.m. as an indication to us to enter into spiritual communion with the Lord. *Please see "Adorers of the Blessed Sacrament"